Flathead High School Athletic Training has existed since the 1980s when Tim Bennett was hired as the 1st athletic trainer at the school. It has gone through many changes, but exists in its' current form of KRMC supplying the community w/ athletic trainers at both high schools in Kalispell. Athletic trainers (ATs) are highly qualified, multi-skilled health care professionals who collaborate with physicians to provide preventative services, emergency care, clinical diagnosis, therapeutic intervention and rehabilitation of injuries and medical conditions. Athletic trainers work under the direction of a physician as prescribed by state licensure statutes. The NATA Code of Ethics states the principles of ethical behavior that should be followed in the practice of athletic training. Athletic trainers are sometimes confused with personal trainers. There is, however, a large difference in the education, skillset, job duties and patients of an athletic trainer and a personal trainer. The athletic training academic curriculum and clinical training follows the medical model. Athletic trainers must graduate from an accredited baccalaureate or master’s program, and 70% of ATs have a master’s degree. Learn more about the education of athletic trainers. The current athletic trainer, Brian Straub, is a 2007 graduate of Iowa State University, and is in his 12th year of working with high school athletes, first as an athletic trainer in Texas at Mansfield Summit High School, and now at Flathead High School. His goal is to give the students at Flathead High School the best medical treatment available for injuries sustained during activity participation. 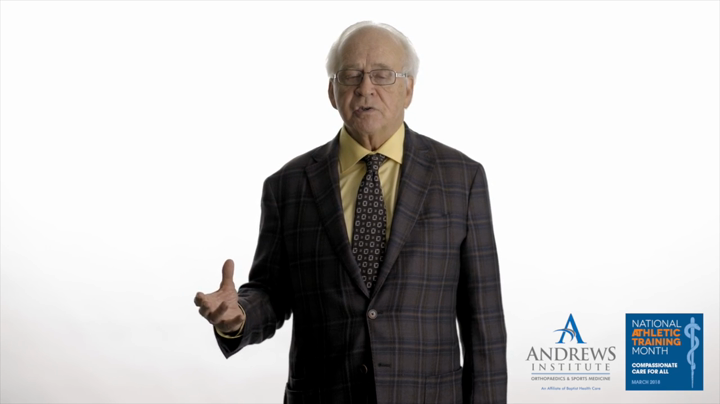 Doctor Andrews is internationally known and recognized for his skills as an orthopaedic surgeon as well as his scientific and clinic research contributions in knee, shoulder and elbow injury prevention and treatment. In addition, he has made major presentations around the world, and has authored numerous scientific articles and books. He has a long list of notable patients across the professional athletic spectrum: Bo Jackson, Roger Clemens, Michael Jordan and Jack Nicklaus to name a few. Celebrating National Athletic Training Month - March 2019! Western AA Athletic Trainers at the 2019 Western AA Divisional Basketball Tournament being honored for their service and dedication to the health and well-being of their student-athletes at their respective schools. Read the special message NATA has put out for athletic trainers across the world.